Wasteland Racers 2071 © 2005 Triotech Amusement. 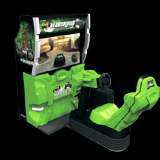 Wasteland Racers 2071 is a car racing game and the first arcade game with HD projection system on a 52-inch widescreen with surround sound. The game features up to 2Gs of acceleration and 100 movements per second, allowing players to realistically experience every bump and thrust on the road with extreme motion in every jump, turn, twist, and crash. Players race through post-apocalyptic race tracks in recreated cities with a choice of the available souped-up cars including 'destroyer', 'interceptor', 'hellbender', 'dune raider', 'milkshake' and 'crusher.' Wasteland is linkable for up to 8 machines for incredible multiple player action. Upon completion of a perfect race, players will receive secret codes to unlock hidden tracks and cars. They will also receive a code to enter their high score online to view their worldwide ranking. The game runs on PC-based hardware, under Windows XP. The actual executable filename for the game is 'arcade.exe'. This filename was actually seen on the game in an error dialog when the game crashed at a Chuck E. Cheese in Kentwood, Michigan, USA.